Cosmos: A Spacetime Odyssey has wrapped up, with the final episode airing last Sunday. Here I am reviewing Episodes 10-13 of the series. See also my reviews of Episodes 1-4 and Episodes 5-9.Episode 10, “The Electric Boy” tells the story of Michael Faraday. Faraday is a personal favorite of mine, quite possibly the greatest experimental scientist of all time, and yes, I am including Tesla in that statement. Faraday, a poor bookbinder’s apprentice with no mathematical background, was granted the good fortune to be hired by the famous chemist Humphrey Davy, and eventually went on to surpass his mentor. Over the course of his life, while battling a gradually failing memory, he invented the electric motor, the electric generator, and a precursor of the Bunsen burner, discovered electromagnetic induction, the laws of electrolysis, and numerous chemical discoveries, and proved that light was an electromagnetic wave. Faraday’s story is an inspirational and far-reaching one, and Dr. Tyson truly does it justice. Episode 11, “The Immortals”, draws on Episode 12 of the original series, “Encyclopedia Galactica”, and is an exploration into how human civilization can survive into the distant future, through stories, through our DNA, our radio emissions, and the colonization of space. The episode bounces around between different topics, but ends on an optimistic note that the human race will be able to avoid the many disasters that threaten us and spread out into the cosmos. Episodes 12 and 13 both draw heavily on the themes of the final episode of Dr. Sagan’s original series, “Who Speaks for Earth?”, with a side of Episode 10, “The Edge of Forever” in the latter case. “Who Speaks for Earth?” begins with a long and solemn discourse on the dangers of nuclear war (being produced in 1980), followed by a warning against the anti-intellectualism reflected in the murder of Hypatia and the burning of the Library of Alexandria. Finally, Dr. Sagan ends with a plea to cherish life and journey peacefully into the cosmos. If “The World Set Free” dealt with threats to the environment and civilization, Episode 13 of the new series, “Unafraid of the Dark”, renews the second part of the message of “Who Speaks for Earth?” with a call for faith in science. To do this, Dr. Tyson cuts a winding path, from the discovery of cosmic rays by Victor Hess, to the theories of supernovae, neutron stars, and dark matter developed by Fritz Zwicky decades before they were widely accepted, to the message to the stars carried by the Voyager spacecraft. Through all of this, Dr. Tyson repeatedly states frankly that science doesn’t have all the answers, and that’s okay, because we’re constantly searching for new ones and refining and improving the ones we have. Cosmos: A Spacetime Odyssey ends with Carl Sagan’s reflections on the Pale Blue Dot, which really should have been in the original, but couldn’t be due to the fact that they weren’t uttered until 1994. Dr. Tyson follows this up with five rules of science and an appeal to its explanatory power. I really enjoyed the new Cosmos series. 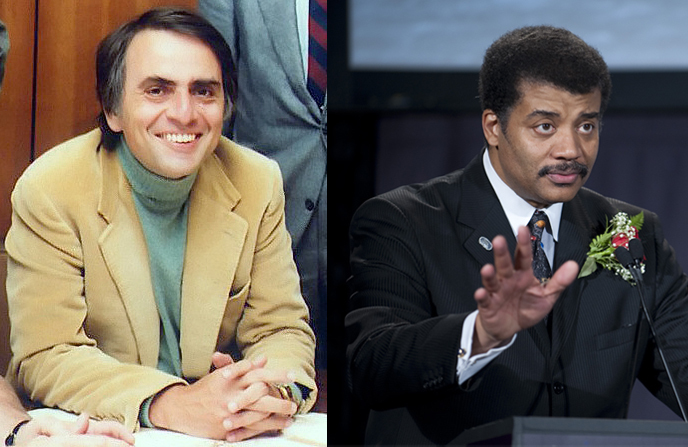 The original Cosmos was not quite like the modern science shows that pervade cable television. It was equally flashy and dazzling given the technology of its time, but it slower, more methodical, explaining concepts from a little bit more of the basics out to the limits of our knowledge, and, most distinctively, with later episodes building somewhat on earlier ones. It was also wide ranging. Though billed as a show about the universe, it was really more about our relationship with the universe, hence the episodes on evolution, the human brain, and threats to civilization. In all of this, I believe that Cosmos: A Spacetime Odyssey lives up to the original. Not only that, but it is well-written and well-narrated by Dr. Tyson, while paying appropriate homage to Dr. Sagan’s best line. The only really dull spot was the stilted and too-fast first episode, and the rest was all top quality. In short, it has fully earned its place alongside Cosmos: A Personal Voyage. My rating: 5 out of 5. I'm a full-time astrophysicist and a part-time science fiction writer. This entry was posted in Science, TV Reviews and tagged carl sagan, cosmos, neil degrasse tyson. Bookmark the permalink.